Modiano makes a powerful playing card. The card is ultra thick and very textured. Modiano poker cards are thicker than other plastic playing cards and are less flexible, giving you a very substantial feel. Modiano Cristallo infrared marked cards feature a unique 4 PIP index with characters in all four corners of the card. This makes it easier to be identified by hands, and it will also give your game an exciting new look. Modiano luminous marked playing cards are 100% plastic, wide poker size (2½ x 3½). They are washable, durable and high performing. Modiano 4 index cards are very famous in Europe and Mediterranean. 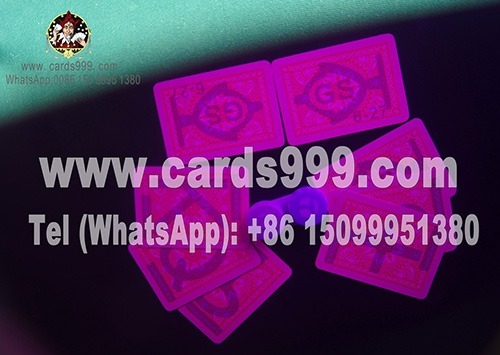 Many colors are available and also can be marked in different ways, UV invisible ink marked poker cards and Infrared marked playing cards. You can use infrared contact lenses poker to see the invisible marks, or marked cards glasses to read the back marks of Modiano infrared marked cards. All kinds of Modiano marked deck of cards are for sale; printable deck of playing cards, you can buy marked cards poker here. Red, pink, orange cards: marked with big font in the middle or small fonts in four corners by dark color (white or black marks).